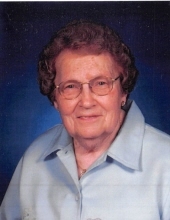 Beverly Frederickson, age 95 of Canby, MN passed away at her home on Thursday. February 7, 2019. Funeral service will be 11:00am on Monday, February 11th at the Antelope Hills Christian Church, rural Canby. Visitation will be held one hour prior to the service at the church. Burial will be at the Antelope Hills Christian Church Cemetery. Houseman Funeral Home-Birk Chapel of Canby is entrusted with the arrangements. Beverly Myrtle Frederickson was born on March 15, 1923 to Alfred and Sylvia (Buchanan) Westfield at their home in Lac Que Parle County, MN. She attended eight years of country school followed by high school at Madison, MN. After graduating high school, she took teacher’s training in Madison and taught country school in Districts 66, 61 and 25. After further education in Moorhead, MN and Mankato, MN she taught at Appleton Elementary School for five years. Beverly married Dennis Frederickson on February 24, 1963 and immediately became “Mom” to Joleen and Marna. Lyndell was born into the family in 1964. They farmed near Porter, MN. After many years of being a homemaker, Beverly started working at Canby Farmers Co-op Association as a cashier. Dennis and Beverly retired and moved into Canby in 2000. Beverly passed away at home on Thursday, February 7, 2019 at the age of 95. Survivors include her husband of 55 years, Dennis Frederickson, Canby; two step children: Joleen (James) Quade, Jeffers, MN and Marna (John) Fuchser, Malcolm, NE; son, Lyndell Frederickson, Canby; seven grandchildren and six great-grandchildren; one brother, Merlin Westfield; one sister, Marcella Oellien and many nieces, nephews, other relatives and friends. To plant a tree in memory of Beverly Myrtle Frederickson, please visit our Tribute Store. "Email Address" would like to share the life celebration of Beverly Myrtle Frederickson. Click on the "link" to go to share a favorite memory or leave a condolence message for the family.